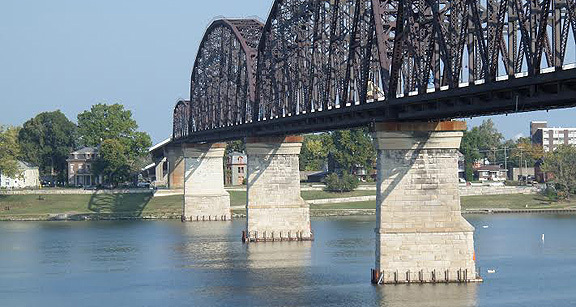 Project obstacles and solutions: The Big Four Bridge was built in 1883 as a railroad bridge crossing the Ohio River. The bridge was converted to a pedestrian bridge (see our previous case study on that rehabilitation project.) However, the cut limestone blocks on the original piers were showing considerable wear below the water line. T & C Contracting was hired to install a concrete collar around each of the piers, from 30 inches above to 30 inches below normal pool water levels. Pouring concrete in a river takes considerable logistical and safety management. It also takes some ingenuity from contractors and suppliers. IMI provided two mixer trucks that were rolled onto a deck barge with a concrete pump. The barge was then powered with a tug boat through Mc Alpine Lock and Dam. The trucks were then loaded with a second pump positioned on the shore, which was supplied with concrete from two other IMI mixer trucks. From there, it made its way down river to the Big Four Bridge. Once anchored beside the bridge, concrete was pumped into the forms. As the mixers were emptied, the barge was tugged back to the shoreline loading area for more concrete. This process was repeated until the project was complete. The concrete specifications for this project called for a high slump mix that would flow to the bottom of the forms and consolidate with little to no vibration. The mix also needed a slow hydration period to ensure the mix would remain workable until the entire form was filled. IMI QC/QA designed a concrete mix that used a high range water reducer to keep bleed water to a minimum and strengths high. The mix also used a retarder to slow set times and keep the slumps consistent throughout the pour given the considerable time that it took to get the concrete from shore to the project. IMI also used an anti-wash admixture in the concrete. This kept the concrete paste from diluting and separating from the mix when it came into contact with water in the forms. In all, IMI supplied 176 yards of concrete for this project.